The gold chain-link fence project can be seen as red velvet curtains at one of Baltimore's most cultured theatres, as it opens for an exciting contemporary art exhibition. Mount Vernon is a stage set within important architecture, public and private museums, schools, churches, music, arts, fairs, foods and more – all of which underlined by rich american history. Despite being well loved, few resident and non-resident visitors to Mount Vernon can slow down or step back enough to truly grasp and take full advantage of all that is around them. By temporarily enclosing all four quadrants of this prominent park, it becomes an impossibility to walk through the space without considering your surroundings. The actions resulting from the fence will encourage an opportunity to re-see and re-consider this complex space in a new and different way. The gold chain link fence might be thought about as an accountable caesura, to denote a physical pause or break in space which can pivot the vast spectrum of this monumental location over the course of a temporary time.  Frames the four squares at Mount Vernon Place symmetrically; highlighting, not hiding, this National Landmark. Reflects the fencing that currently wraps around the George Washington Monument, at the center of the four squares.  An opportunity to re-see and re-consider this historic site from an alternate perspective.  Encourages conversation and discourse about the ways you see, interact and consider such complex environments.  Provides artists' an installation space separate from public, for safety over the 2 week installation process. Separation allows tools and unanchored art objects to remain safely within the park until the exhibition is ready to be revealed to the public. The separation also gives artists room to achieve their desired aesthetics to a point which they are ready to be interacted with.  Re-introduces the park as the product of a temporary art exhibition in which partners of the show have been working toward creating a temporary, significant and relative use of the historic Mount Vernon Place.  Fence unassembled as community inter-activity. A concentration of activity and conversation amongst volunteers and visitors are inspired through circumstances in the environment.  The gold chain-link fence relates to a pivotal moment in time between exceptional changes in the park usage: from normal activity, to no activity, to high activity which occurs at de-installation in correlation with the anticipated opening of Beyond the Compass, Beyond the Square . 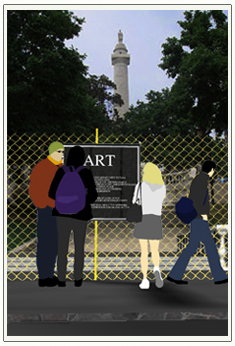 The pause emphasizes the power of the park as a timeless social ground for all who visit.